When You Need Options, We Have Solutions! Give us a little info about your house – Simple & Easy! If your house meets our buying criteria, we’ll set up a quick appointment to see it. You’ll get a fair no-obligation offer. The closing will be held at a local respected title company so you get cash in as little as 5 days! Timeframe: Once we get your info, we will make you a fair all-cash offer in about 24 hours. Then we can schedule the closing in as little as 5 days or whenever works for your schedule. 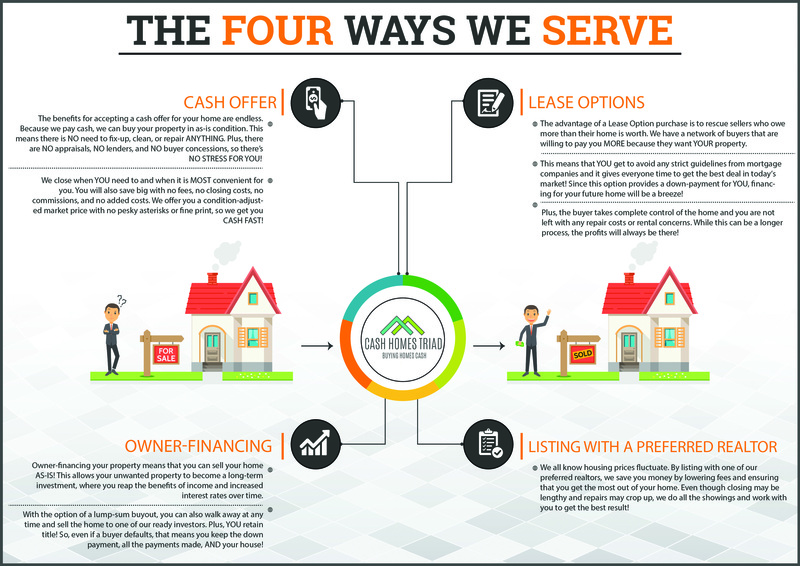 Selling Your House Can Be A Simple And Easy Process. Cash Homes Triad buys houses with cash in as little as 5 days. We don’t want to list your house. We want to buy it directly from you without using middlemen such as real estate agents. Because we pay with all-cash, we’re able to close fast. We do not charge commissions or fees when we buy your house. That means that you get to keep more of your own money so your worrying goes down and your peacefulness goes up.